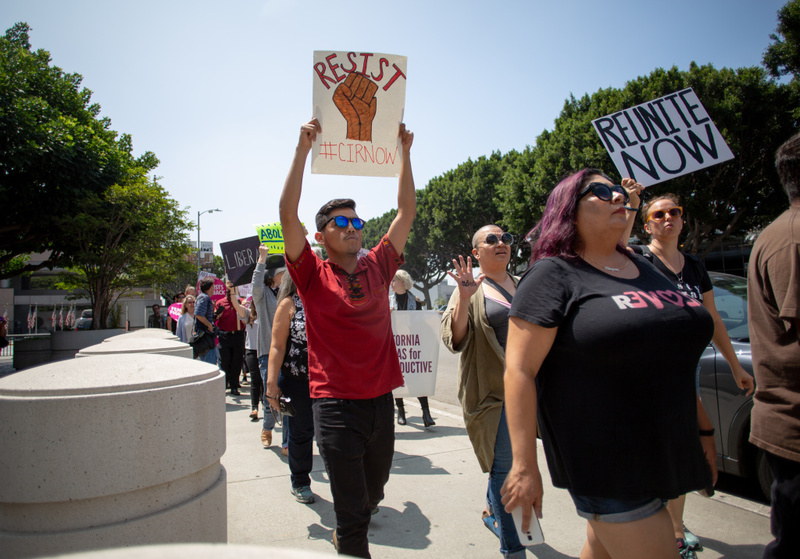 Protesters circle the Immigration and Customs Enforcement processing center in protest to the Trump administrations family separations related to the zero-tolerance policy along the border, in Los Angeles, California, June 21, 2018. A federal judge in San Diego issued an order Tuesday directing the Trump administration to reunite migrant families who have been separated at the border within 30 days. Children under five must be reunited with their parents within 14 days. The judge’s order bars officials from separating migrant families who cross the border illegally, as done recently under a now rescinded Trump administration policy. But questions remain whether officials will be able to reunite as many as 2,000 children with their parents in a few weeks. Immigration officials say they are working to reunite families, and that they know where all the children are located. Attorney Omar Jadwat of the ACLU, which brought the lawsuit the judge ruled on, says he’s optimistic the government can pull off the logistics in time. But others like Liz Martinez with Freedom for Immigrants, a local group that works with detainees, are skeptical.